Of all the storylines that emerged from Wednesday’s 106-102 Bulls win over the Miami Heat–like Derrick Rose’s absence with a groin problem, John Lucas III’s team-high 24 points, LeBron James and Dwyane Wade combining for 71 points and the return of Luol Deng and C.J. Watson–the most enduring image is of a flawed and fallible Heat team just about everyone is picking to win the NBA title? No one is saying the Bulls are favorites. But this Heat team, with four losses in its last seven games and now three and a half games behind the injury wracked Bulls, certainly looks vulnerable. 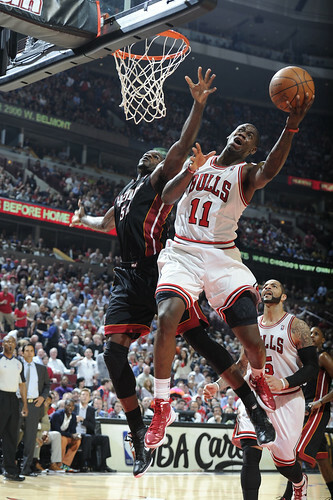 Their rebounding is atrocious as they were dominated by the Bulls 50-34 overall and 21-7 in second chance points. James, who was superb with 35 points and four steals, moaned after the game about the Heat being too small. That underscored perhaps even more — and even with the Bulls perimeter injuries as Rose could miss a few games now as he was walking very stiffly after the game — the Bulls apparent decision with the NBA trading deadline Thursday afternoon to keep their four big men. Joakim Noah, Carlos Boozer, Taj Gibson and Omer Asik combined for 26 rebounds, more than the entire Heat starting lineup and almost as much as Miami had for the game. There’s been this long debate since Miami won the Eastern Conference finals over the Bulls 4-1 whether the Bulls positives at point guard and center could outweigh the Heat’s on the wings and power forward with Chris Bosh. Bosh was crucial in the playoffs, but he was three of 15 Wednesday for 12 points and reverted to his soft approach to the game. 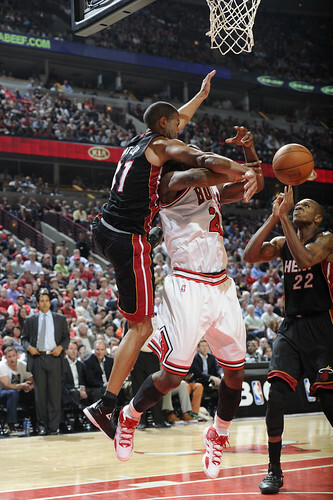 Noah with his size gave Bosh problems. But even when Bosh got switches, like once late against Jimmy Butler, Bosh instead faded back for a jump shot instead of attacking the smaller player. Sure, when his shot is going he is a problem. But he played just under 37 minutes and had three rebounds. Really, if you are 6-11 and playing that much you should be hit in the head with three rebounds when not even trying. In many respects, the Heat still is a work in progress as Spoelstra still has no real rotation. He finally put another center, Dexter Pittman, into the game, but only after he didn’t play in the first half. Then Spoelstra finally found his best shooter, James Jones, and played him virtually the entire fourth quarter after barely playing him at all before that. And Jones made a pair of threes in the last 10 seconds when the Heat pulled within two points after the Bulls led by 10 with three minutes left. 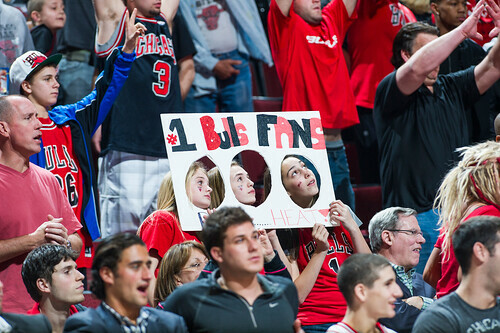 But the Bulls made free throws to close out the game. Still, what the game demonstrated more was that the intangibles, the whole that is difficult to measure, does matter and can make a difference. 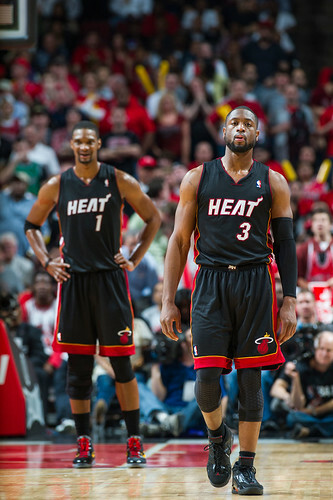 The Bulls cannot match the Heat’s talent of James, Wade and Bosh, especially with Deng with that ligament tear in his wrist which clearly is limiting his game and will the rest of the season. Though Deng can chase James on defense, Deng’s offensive game is basically without the slashing and finishing and more three point spot up shooting. It’s not going to be easy, though, as it looked like Miami players went after Deng’s bad left wrist several times and Deng conceded after the game there were some painful moments. But both he and Watson returned knowing Rose would be out, and Watson even seemed to reinjure his ankle early in the game but stayed in, though he only played three seconds in the fourth quarter. But I thought those inspirational efforts of guys like Deng and Watson were secondary to the symbolic difference between the teams. The Heat is the team of stars, dancing and calling attention to themselves, the team of big dunks and fancy promises. 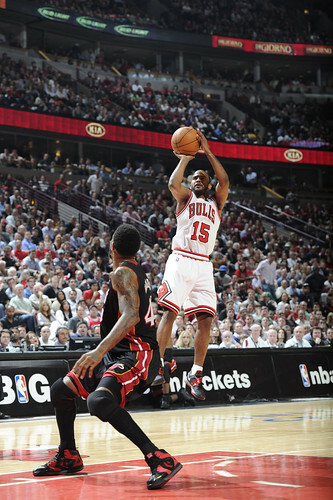 The Bulls couldn’t beat that last season, and few give them a chance to do so this season. And Miami did win the previous game between the teams, though barely, down the stretch 97-93 in Miami. On Wednesday in a national ESPN game that supposedly was missing its incandescence because of the absence of the MVP — and it was — the Bulls made a serious and symbolic statement about who they were and why they should not be counted out, even if the numbers don’t add up. 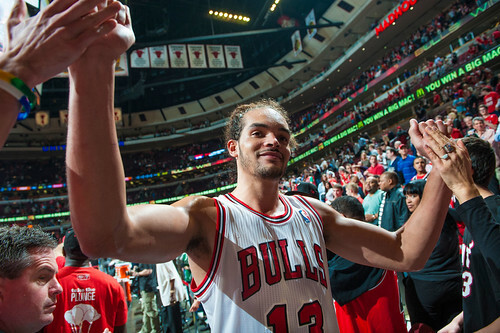 Noah, who puts his soul into these sorts of matchups, was one of the principal obstacles the Heat has no answer for. 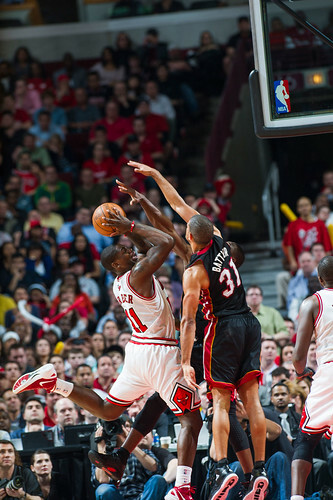 Though he had just six rebounds, Noah also had 14 points and four blocks and many changed Miami shots. That inside presence is the Heat’s principal roadblock, and why they always have so much difficulty with Orlando. Though Bulls coach Tom Thibodeau drills the players on not responding to media talk about the Heat and the potential rivalry and looking ahead, I thought a beaming post game Noah put it best about how the teams are different and why the Bulls can transcend the traditional formula. It sometimes is suggested Miami is style against the Bulls substance, and that was borne out in some measure Wednesday as the Bulls bench outscored Miami’s 56-15. Lucas hit nine of 12 shots, even defended by James late — the supposed reason the Bulls cannot beat Miami because James will shut down Ros — and Lucas scored over James’ man to man defense. 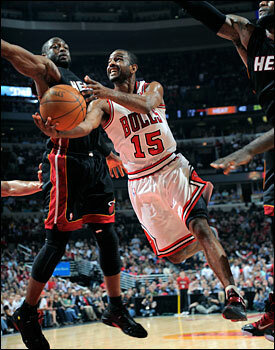 Wade, who led Miami with 36 points after a slow start, had a big fourth quarter with 19 points. But Lucas, who was once cut by the Heat so they could keep Carlos Arroyo, had 11 points in the fourth as his baskets midway through the period enabled the Bulls to maintain a double digit lead most of the quarter and hold off that late Miami run. Really, this guy’s story is every bit as amazing as Jeremy Lin’s. 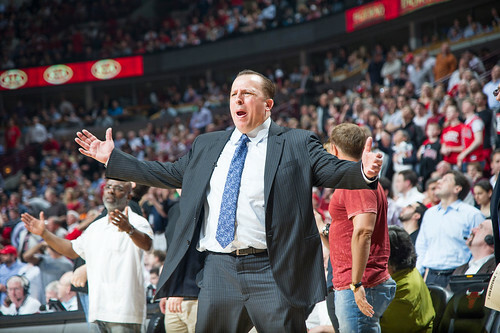 It’s through Thibodeau’s confidence he’s stayed with the Bulls. Lucas has played in China, Spain, Italy and the D-League. He’s been cut by the Rockets, Thunder and Heat. He’s maybe 5-9 or 5-10, but an all around athlete and champion tennis player, like his father, who was an NBA star and later coach. But even with the pressure of the famous name and expectations, the rejections never stopped Lucas. 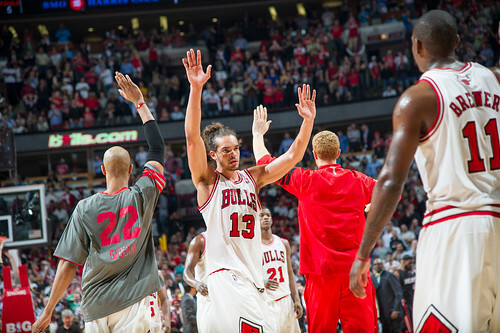 It was a game, really, the Bulls were to have no realistic chance. 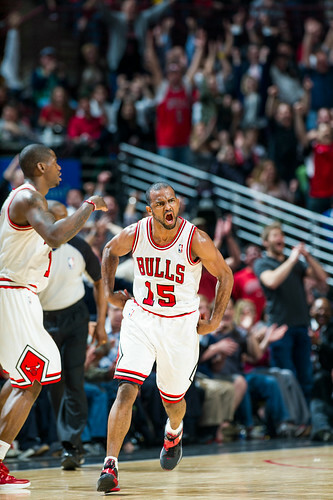 Deng and Watson were uncertain pregame, and Watson even came in hobbling some. He went out hobbling more. 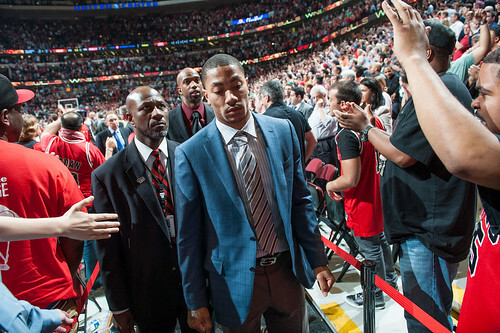 Rose was declared out immediately, and though the team lists him day to day, the suspicion is they’re going to be extra careful like they were when Richard Hamilton had a groin problem and Rose’s return is probably open ended to the point of when he feels capable. 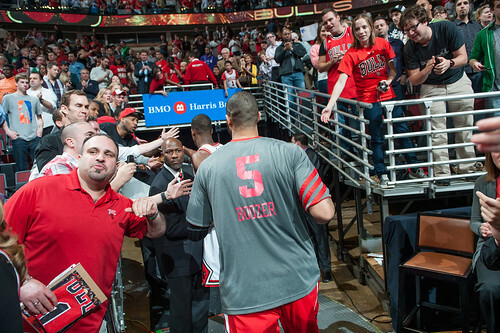 The Bulls now are 8-3 when Rose is out and 36-9 overall. Before the game the sizeable media contingent following an ESPN broadcast was guessing the size of the Heat win and number of James’ points. And no one should dismiss them. They are good. Though no one, apparently, had Lucas in the high scoring pool as Lucas said afterward he was excited now because finally other teams were including him on their scouting reports. Yes, a sign you’ve made it. 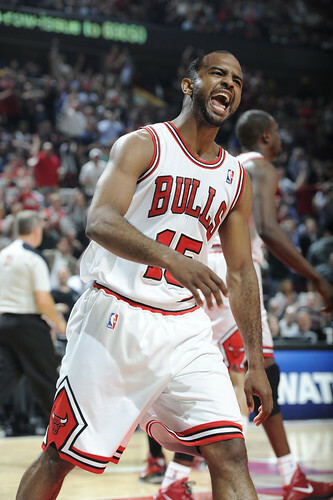 And though James gets criticized for much, he is a student of the game and even knew the nickname for the Bulls bench. The game began uncertainly for the Bulls as James displayed an array of post moves and shots closer to the basket than in previous seasons. Though he’s mocked for passing on late game shot situations, he shot the ball well and did a good job backing down Deng and scoring 14 first quarter points for a 23-19 Miami lead. Watson came down badly on his ankle and clearly was struggling afterward, though he didn’t leave the game for long. But with the reserves into the game to open the second quarter, the Bulls exercised their strength primarily around Gibson with another strong inside game and Asik standing tall and showing more confidence with offensive moves. The talk about fouls always is about Rose, who got fined for what I thought were relatively mild critical comments on the officiating after the Knicks game Monday. But in talking to veteran referees around the league who watch Bulls games regularly, they say the Bulls player treated most unfairly is Asik. That’s because he holds his straight up position best, and that’s no foul even if you absorb contact. But it is a dirty little secret around the NBA that the international players, because of a reputation of being poor defenders, don’t always get a fair shake from the officials. It happened again to Asik, but he mostly shrugs and goes on. Which is a sharp departure from Wade, who complains and stares down officials after almost every drive when he doesn’t get a foul call. Apparently, it’s a family issue as ESPN reported that Wade’s father was ejected from the game by arena security for foul mouthed behavior. 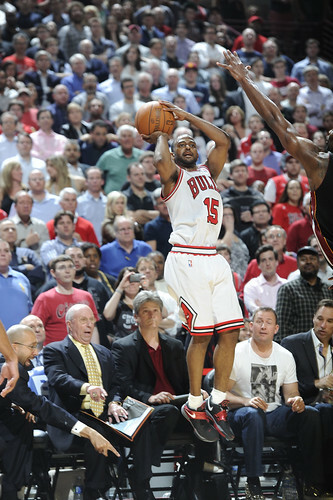 It wasn’t just Wade as the Bulls were feeling the moment as well as Deng and Noah drew technical fouls and Spoelstra added one later. But it was those reserves, who especially move the ball well, who made a difference. That ball movement also is particularly bothersome to Miami. Not many teams can play defense through possessions, though Miami is usually one of the better ones. But both Wade and James get caught playing the passing lanes at times because transition play is the strength of the Heat. Every scouting report against them is headlined to not let them run. The Bulls did a good job of that, holding the fast break points to 15 each for the game, and the Bulls put a 34-19 decision on the Heat in the second quarter with 15 overall rebounds. Butler did a nice job harassing Wade, the ball found Kyle Korver for a pair of threes as the Bulls kept reversing the ball around the befuddled Miami defense and Lucas got going with 11 points and a pair of his own threes as the Bulls took a 53-42 halftime lead. Though the Bulls didn’t use a zone, their defense packed the inside well and kept Miami mostly shooting jump shots, though James is so good finding favorite spots to shoot. Miami cut the Bulls lead quickly to open the third quarter to 57-53, and you thought the Bulls would get a nice pat on the head for making it an interesting first half and the Heat could fulfill its destiny. 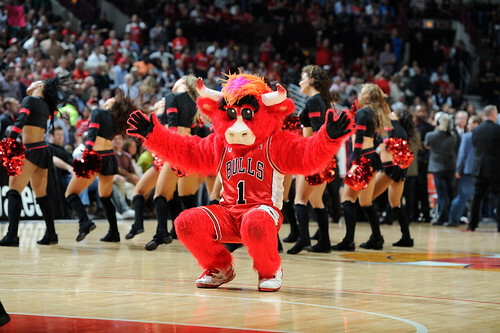 But Watson answered with a drive and free throws and a three, Ronnie Brewer with another active game with 12 points, six rebounds and two steals, got inside for a three point play on a nice find by Deng, Noah threw in a rolling hook and Brewer added a three as the Bulls were a sharp 10 of 19 from long range in the game and took an 81-70 lead entering the fourth. The Bulls haven’t lost when leading after three quarters. 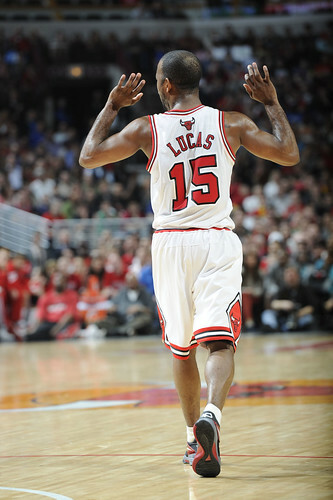 The Bulls maintained that double digit lead most of the fourth quarter as Lucas added another three and then even yelled at Carlos Boozer, who had only two points on four shots but team highs with five assists and eight rebounds, for not coming up to help when Lucas was being trapped. 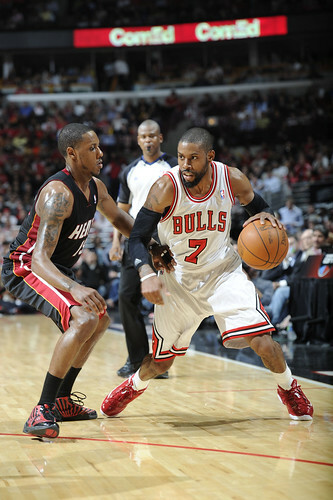 It resulted in a turnover and Wade three to bring Miami within 88-80 with six minutes left. But Deng hit a runner and then Lucas, of all guys, scored on a running bank shot and then going one-on-one first against Norris Cole and then against James to match every Wade basket and it proved enough margin to keep Miami from stealing the game. “It’s the beauty of sports,” said Noah. “You guys never thought (Bulls could win). We believe in each other. That’s why I feel so good now. Nobody thought we’d win a game like this, especially without Derrick. It’s important we not get overexcited. We played hard, and we know the city is pretty excited now (Noah later would go out to inspect that personally). I’m proud of Lukey. That’s my son. So I’m proud of my son. He came out with a lot of energy and I just like his style out there. He was tough from the start and it got us all going. It wasn’t just his scoring. His swag out there was mean and I liked it.